Prior to the erection of the existing Chapel in Outram Street in 1882, the Wesleyans worshipped in a brick building in Low Street at the rear of The Sutton Clothing Hall, now occupied by Mr. Mason, draper, etc. That place of worship was erected in 1812, previous to which time the congregation met in private houses. They had then 70 scholars, whilst the number to-day is 800. The commodious and handsome Sunday School adjoining the Chapel in Welbeck Street was opened, and the Chapel enlarged by the addition of the organ chamber and choir gallery, on May 24th, 1904, at a total cost of £3,165. Minister then—The Rev. W. Platt. The Methodist New Connexion established a Chapel in or about 1837 in Low Street. For a long time past, no doubt, many of Sutton's inhabitants have felt how strangely-looking is the old, narrow, and long stone building nestling apparently as a derelict, and in a state of seclusion, by the side of the Sutton Gas Works, with the constant flowing of the Idle alongside its defiant walls, and yet with such a commanding view from the "portals" of Portland Square. Few people probably have ventured to enquire into its history, and do not even know that malting is now carried on within its stoutly-built walls and substantially-timbered floors and roofing. An examination of the building, with investigations regarding its ancestry, will at once reveal to the historian, or antiquarian, that it has defied the ages of time for, maybe, something like two centuries past; but a peep at its floors and its interior walls will, create astonishment in their cleanliness, reflecting the greatest credit upon their keeper and malster—Mr. Henry Willis, who has held that position for the past 34 years, and who resides in the antiquated cottage (part of which was formerly used as a stable) close by. Having no information from previous chroniclers of events, the whole facts of its history seems to be unknown, but from the present oldest inhabitant of the parish (a nonogenarian) we understand that it was once owned by a Mr. Bacon, who carried on cotton spinning there, and that it may have been the first factory to be erected in the town. The machinery was originally propelled by a large water-wheel connected with the Idle. Later, the premises were used as a school, and again becoming unoccupied, the village juveniles made it a recreative resort. It was in a greatly dilapidated condition when the building passed into the hands of the Gelsthorpe family, of Carter Lane, South Normanton, the present owner being Mr. J. Gelsthorpe, of Annesley Woodhouse. It should be mentioned that malting is now carried on only on a small scale. A Division of the St. John Ambulance Association was instituted at Sutton in 1901, and has now a membership of 34, with Mr. A. H. Bonser. J.P.. as Superintendent, Mr. A. E. Wingrove as First Officer and Hon. Secretary, Hardwiek Lane, and Mr. C. H. Whetton as Treasurer; Messrs. H. J. Frow and J. Wade as Sergeants, and Mr. W. H. Slack as Inspector of Stores. The headquarters is at the Welcome Cafe, Brook Street, having recently removed there from S. Modwen's Hall. Each year a fancy dress ball is held in the Town Hall in aid of its funds. The Hon. Surgeon is Dr. Nesbitt. J.P. Instructor to Nursing Classes—Dr. Mitchell, of Osman House. The Scene of this Picture is the Sutton Market Place, where the Parochial Offices were in the years referred to..
During the many hundred years on the Ocean of Time, the voyage of Sutton's life has not been without its tempests, for waves of distress have swept over the town from time to time in no unmistakable way! Gloomy and pathetic, indeed, were the days of 1847—the period of the agitation in regard to the Corn Laws—and there are many alive to-day who can vividly recall those sad times! The inhabitants were then entirely dependent upon the hand hosiery industry for their livelihood, which at that time completely collapsed, with the result that they were launched on the verge of starvation! Ah! How ill-prepared were they for such a calamity! To intensify the disastrous situation, provisions were dear, flour being 4s. 6d. per stone, and consequently the people were almost at their wits' end as to how they might survive such an hour of distress. The purchasing of bread and meat was quite out of the question by the industrial classes, and it was no uncommon sight to see them seeking their sustenance from cooked suet, rice, potatoes, oat cake, turnips, etc. Happily, as time sped on matters improved somewhat, but again in 1861—at the outbreak of the American Civil War—a repetition of the starvation days was experienced. 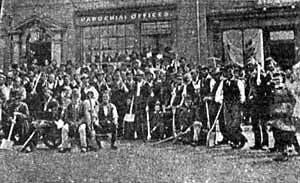 It was during those fearful times that the "Labour Test" was brought into requisition by the Poor Law Authority, and in the accompanying illustration will be seen a sturdy group ready to commence their found task of repairing the "highways and bye-ways" in order to be able to keep the hungry wolf from the doors of their homesteads. The improvements in the Skegby Road, Forest Street (as mentioned in the following page), Stoneyford Lane, and other thoroughfares were carried out then, whilst the Fifth Duke of Portland (probably out of compassion to the sufferers) employed as many as 200 of Sutton's stockingers on his estate at Welbeck, where extensive alterations were then effected. Then, again, many were set by the parish authorities to quarry stone from the Hillocks (now fllled in) wherewith to repair the public roads in the district. It is said that in some cases the "labourers " were paid at the rate of only 6d. per day for their labours. How grateful ought we to feel that we are at this age living in better times! This is one of the chief arteries of the town, and it has witnessed as many changes, in one way or another, as most of its neighbouring veins. It is also known as Station Road. Up to 1879 the road was a portion of the Newark and Newhaven Turnpike Trust, and in 1847 it received the attention of the "nothing-to-do stockingers" in what was known as the "Labour Test," who lowered the road considerably from near Mr. T. Stendall's farmstead to the Sheepwash. One of the three toll-bars in the parish was located near Forest Lodge, whilst there was formerly a public-house in the vicinity of Mr. Stendall's home, it standing by the roadside. Coming nearer to the town, we may state that there was also another inn once upon a time, known as "The Sailor Boy," situated almost opposite Mr. Isaac Wass's farmstead, and a smithy a few doors away, which was used for many years by the late Mr. John Harris. The thoroughfare was also known as Oates' Hill, after the late Mr. Wm. Oates (the then agent to the Unwin Family), whose residence was demolished early in 1893 for the present building, which is now the residence of Dr. Porter. On the erection of the Conservative Club's new premises in 1905, two old thatched cottages were destroyed at the entrance. Forest Street can boast of containing both the Midland Railway Stations, the Public Free Library, the Conservative Club, and King's Theatre, with several other important undertakings on its side. This tiny, but much-used vein, is to be found between Low Street and Parliament Street, and was so christened on account of the "Town Criers, or Bellmen," making it their "castle, or residence." The first crier known who lived there was a Mr. John Ward, who was followed by Mr. James Hall. Then came Mr. Wm. Scott, and now Mr. C. Pegg, who, by taking up his abode in Mount Street, has broken the long link of the yard with the officials which created its fame. The famous bell has been transmitted from one generation to another of the same family since Mr. Ward held the position. It is believed that at one time there was a small starch manufactory here, as well as a chandlery, and the yard, which is an off-shoot of Mill Street (formerly entitled Windmill Lane) then received the name of " Starch Yard," which title it held until a few years ago. It now bears the headline name, after the owner of the property there—Mr. John Aked (an octogenarian), who left Sutton, with his octogenarian wife, 14 years ago to reside at Carrington. The old couple have lived in retirement for a number of years past. The yard has an ingress, but no egress. The builder first took his trowel and spade into this street in the year 1832, erecting four cottages nearly in the centre, which now bears his name:—"D. Milnes, builder, 1832." This being the period when the introduction of the first Reform Bill in Parliament took place, Mr. Milnes had "Reform Street," with a pointer attached, engraved at one end of the cottages, and from that auspicious occasion the name has remained unaltered. The house at the entrance to the Urban District Council's depot in Church Street, where Mrs. Jackson lives, contains the following inscription above the doorway:—"B.I.D., 1713. with the hieroglyphic heart." Thus the house is 194 years old. We have now arrived at no unimportant chapter in our history! Were we to give illustrations of the many changes which have taken place from the moment our forefathers selected this particular site in this portion of the famous Sherwood Forest as to be (for all time, maybe) the "public place for the purposes of buying and selling," for the township of Sutton-in-Ashfield, up to the present time, a kaleidoscopic scene would be the result. The "change of all changes," however, did not take place until 1905, when a mammoth clearance of property in and around its borders was effected, giving the commanding square as we now behold it. As may be imagined, to accomplish such an undertaking was no mean task on the part of the Urban District Council, and particularly to Councillor C. H. Kitchen, who was at the helm of affairs, and it may be stated that it was one of the most gigantic schemes of modern times taken in hand by the Council. A loan of £13.978 was first obtained before the "sweeping" policy was entered upon, and one of the early steps was to change sites with the Home Brewery Company for the erection of a new hotel. That having been done, and the existing hotel occupied by Mr. Bailey, the "old one" (which, by-the-way, had only been rebuilt a few years previously, and which stood at the narrow entrance to the Market Place from the Low Street approach, and which important thoroughfare it directly faced), was then demolished. Next, the Council put their hands into their pockets and handed over to the Home Brewery Company (in addition to the site) a sum of £1,950 towards the new hotel structure. The property from a portion of King Street, including the Congregational Church (for which the Council paid £2,000), carrying with it the old-established butcher's shop und the contiguous dwellings in Rhodes' Yard; down to the old Market Hotel, was afterwards destroyed. Those residing in the shop premises at the time of being "condemned" were—Mr. T. Wilson (hairdresser), Mr. J. Turner (grocer), Mr. S. Childs (grocer), Mr. F. Starr (butcher, and where the late Mr. George Rhodes previously lived), Mrs. W. Needham (ironmonger), Mr. W. Searson (pork butcher, and where little Mr. Aaron Richardson previously carried on business), and Mr. W. Willey (fishmonger). Some of the land available afterwards for disposal realised a sum of £6 per yard. The present area of the square for stallage purposes is 120ft. by 110ft., the total area being 3,266 sq. yards. The old market, which was of triangular shape, with the property referred to above running obliquely from the Low Street entrance to the King Street corner, was 760 sq. yards, the increase thus being, approximately. 2,500 sq. yards. On the site of the hotel recently pulled down previously stood "The Corner Bin," which was kept by the late Mrs. Towers for many years, and in a room attaohed to this house the Nottingham and Notts. Bank first opened their branch in 1873. On the opposite side (where Mr. Flood's shop now is) was Mr. John Oscroft's butcher's shop, whilst where the Denman's Head vaults are now formerly stood Mr. Fred Morrell's second-hand furniture stores, etc. Mrs. Needham's shop was the first to be erected on the new sites in 1905, followed by Messrs. C A. Aked's and H. J. Charlton's, which were built by Mr. A. Walton, and opened early in 1907. The same builder also started to erect Messrs. Fletcher Bros, premises at the end of June, 1907. For a number of years the Market Place and other open spaces belonging to the Urban District Council were under the control of Mr. W. Williams, of Putney, but in 1907 the Council took the management into their own hands, rejecting an offer of £260 made by Mr. Williams to retain his position for a further term of 3 years. There being a Sherwood Road as well as Sherwood Street in the parish, it may be puzzling sometimes "to get where one wants to get." The latter, which is interlinked with Parliament Street and Low Street, was known in the days of our ancestors as "Gadsby's Yard,"—derived from a family of that name, and who owned the property there then, and who resided in a shop on the site of the old Market Hotel, with the entrance door facing Low Street. Thomas (the father of the family) died February 23rd, 1791, aged 42, and Rosamond (the mother), August 12th, 1827. aged 80. It will thus be seen that that family (whose burial-ground is in the south side of Sutton churchyard) were residents of Sutton 130 years ago at least. Matthew, their son, was an old hero. He enlisted in the 13th Light Dragoons in 1805, and went through the whole of the Peninsular War, being fortunate enough to escape without a wound. He was also present at Waterloo, and afterwards went out to the East Indies with his regiment, where he received his discharge, with a pension of 1s. 21/2d. per day. He died at Pinxton on October 28th, 1865. aged 82, but was interred at Sutton November 1st in a coffin that he had purchased 27 years previously. He was borne to his last resting-place by Sergeant T. Otaway, Corporal Dellow. Sergeant Truelove, and Private Hibbert. Sherwood Road lies off Kirkby Road, which (from the Staff of Life corner) was originally known as Rice Road. Has also played its part in the history of the town, one of the most historic buildings in the vicinity being that where Mr. C. B. Beecroft, grocer, auctioneer, and farmer, resides. It has variously found shelter for the gentleman farmer, the minister, the publican, the doctor, and now the auctioneer, etc. The gentleman farmer of the name of Mr. Samuel Downing was the first occupant of the house of which we have any record, and he would be living there in or about 1780, at which period he and another farmer named Outram were the most influential gentlemen in the parish. The death of Mr. Downing's wife took place September 8th, 1821, aged 77, and Mr. Downing's August 2nd, 1827, aged 88. They left behind them several daughters, one of whom (Frances) became the wife of the Rev. Charles Nott, the Particular Baptist minister, and they carried on a farming business there, retailing milk out to the inhabitants. Mrs. Nott died November 15th, 1853, aged 69, whilst her unmarried sister (Ann Downing) died Nov. 13th, 1855. These are buried in Sutton churchyard. The family worshipped at the Congregational Church, but on accepting an innuendo by the late Rev. C. Wilson that it was only natural that Mrs. Nott should attend the same place of worship as her husband, the family transferred their interest to the Particular Baptist sect. Downing Street (New Cross) received its name from this family. Subsequently the residence was converted into a public-house, having for its tenant the late Mr. R. Adlington, who was followed by the late Mr. Frank Handley. Later, it became a private residence again, and then the late Dr. Diver took up his abode there, followed by the late Dr. Booker and the late Dr. Dyer. From, an open window at the Swan Inn. then kept by the late Mr. W. Beecroft, the late Sir Robert Clifton addressed an audience gathered in Devonshire Square about 1867. Now one of the leading streets of the town, was once upon a time recognised as "Beggar Street." It should be considered that when the old Local Board applied the title to this street it was desired to reverence the memory of the late Mr. William Downing Adlington as well, who, at one time, owned some of the land in that vicinity. This is probably considered by many to be the "prima-donna" (not, however, for its "beauty" or "stateliness," but more particularly from a business point of view) of all our public ways or streets, although the dramatis personal, in Swan Street and Club Street on the right, and Crier's Yard and Sherwood Street on the left, are not such admirable supporters as could be desired. How the street became so named we are not altogether certain, but in all probability the first settlers in the town lived on the higher part, in the neighbourhood of the Parish Church, and the street nestling in the valley of the Idle, with the rising slopes of "High" Street, and "High" Pavement—hence the title of those streets— on the one side, and Church Street on the other, it may have received its title under those natural circumstances. In its time, too, it has undergone some drastic changes. Where the Rifleman Hotel now is formerly stood the late Mr. E. Outram's farmhouse, with spacious stackyard attached, Mr. Outram at that time being the principal farmer in the parish. Only recently one of the oldest houses in the street was demolished to make room for the fine building belonging to Mr. G. J. Hepworth, clothier. That dwelling used to be occupied by Mr. George Lee, his wife, and latterly his daughter, and was also for many years occupied by Mr. James Whetton, the Mansfield and Sutton carrier. It was built probably about 1660. For many years Mr. E. Crofts carried on a successful pawnbroking business on his premises. The property owned by Mr. J. Hayes, butcher, was totally rebuilt a few years ago, and on this site formerly stood a little shop which was occupied by Mr. James Jackson, and afterwards by Mr. German Buxton, who, after making a fortune in Australia, settled at Sutton, taking an active part in local affairs and serving on the Local Board for some years. This property stood on what once was the garden of the Vicarage, the last Vicar to reside there being the Rev. Thomas Hurt, M.A., who died in March, 1826, and is buried with his wife, Amelia, who died the following April, in Sutton Churchyard. His father was Rector of Teversal, and the builder probably of Dalestorth House. His eldest son was Dr. Hurt, the physician of West Gate. Mansfield, his other son was Rector of Linby, and married a Miss Unwin, of Sutton Hall, a tablet to her memory being placed in Linby Church. A row of poplar trees used to run down the side of the garden next to Low Street, and the garden itself was extensive, running up to Parliament Street and to the stables now occupied by Messrs. Hayes and Willey, and once by Mr. Wm. Wilson, the Nottingham and Sutton carrier. The Brick and Tile Inn was the residence of Mr. Hurt, and afterwards of the Woolleys, who were the proprietors of Birchwood Colliery, and afterwards the occupies of Sutton Hall, succeeding Captain Jennier there. The inn then stood at the corner of Club Street, where is now Mr. Jolly's shop. The Unitarians used to meet in a building near here. The premises until recently occupied by Messrs. Straw and Webster were entered by descending three stone steps, and the late Mr. W. Parker, prior to taking up his residence in Stoney Street, lived there. A small stone wall also bordered the footpath in front of Messrs. Oscroft's and Searson's premises. The first chapel used by the Sutton Weslevans was built in Low Street.